Laura can’t remember who she is. But the rest of the world knows. Because Laura is famous – a dying girl who was frozen until she could be cured. A real-life Sleeping Beauty. But what happens when you wake up one day and the world has moved on forty years? Could you build a new life – while solving the mystery of what happened to the old one? Well you’d have to pick up with that glimmering cover, wouldn’t you? Fab sense of the 80s in the eyemake up plus the glitch in the lettering give you an enticing hint of what’s to come. Couple that with the rainbows and blank white spaces and you totally get the sense of both glamour and mystery involved. I have to say I am astonished that Beauty Sleep is 438 pages in my paperback version. I read it on Kindle – and it certainly didn’t seem long at all. Another thing I really hadn’t expected is how funny it is. Nor the touch of Enid Blyton/Elinor M. Brent-Dyer boarding school – which was both pleasurable and intriguing. Beauty Sleep would make a marvellous story for an older adult and an adolescent to read in parallel and chat about. The cultural differences of Laura’s earlier pre-tech world and the one she wakes up in are fascinating. The point isn’t nostalgia – but an honest comparison. The setting and the themes are great – yet it’s the drama that makes you read on. All sorts of hares are set running and things rarely work out quite how you’d expect (unless you’re a particularly sophisticated and experienced reader). The story is distressing in parts but the payoffs far outweigh those necessary moments with humour and heart. Despite some tricky subject matter, it most definitely is not bleak. Kathryn Evans focuses on the emotional consequences – rather than on dry technology or forecasting. A Haynes Guide to the Future it is not. 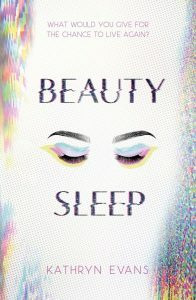 Highly recommended – an example of speculative fiction at its best, Beauty Sleep explores both what-ifs and their consequences. 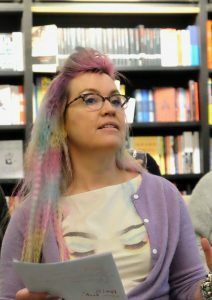 Kathy at her book launch in Chichester – geta load of that frock and the big hair! One admission – the relationship between Beauty Sleep and the traditional fairytale Sleeping Beauty is pretty tangential. There is no dodgy prince waking Laura up with a ‘kiss’, I’m pleased to say. The relevance is more to do with social media perception – which is utterly right for the near-future portrayed. Strictly speaking, I shouldn’t be reviewing it here perhaps, but if I can boost this highly original YA thriller, I will. This entry was posted in Review and tagged Beauty Sleep, Kathryn Evans, Usborne, YA by KMLockwood. Bookmark the permalink.